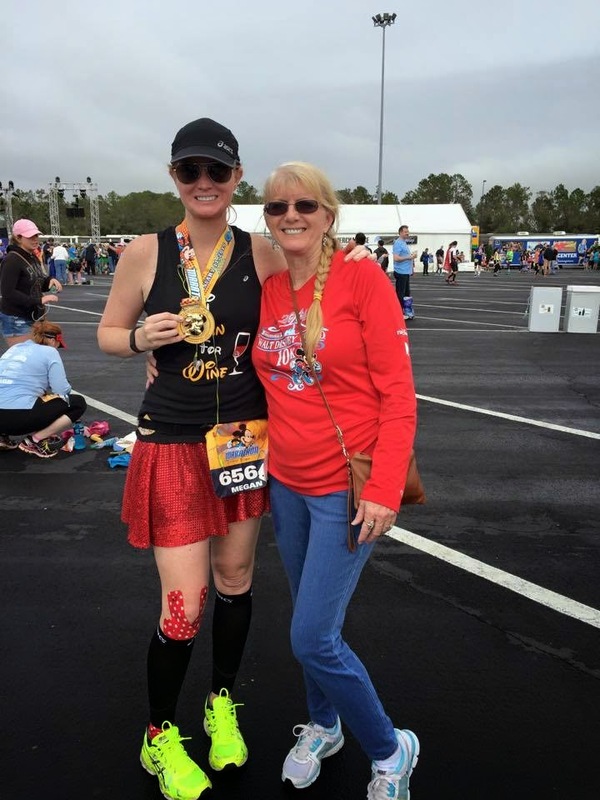 This past weekend, I completed my fourth full marathon, the runDisney 2015 Walt Disney World Marathon. 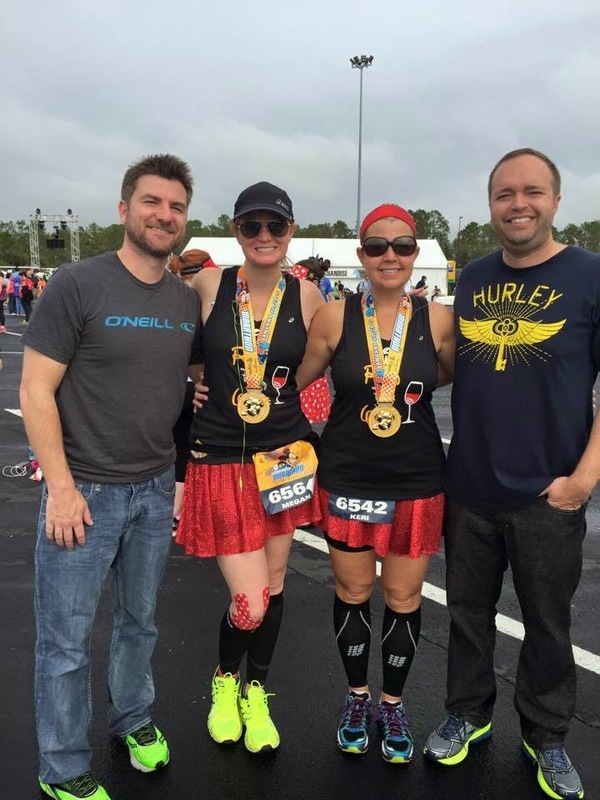 This was a much different experience than the other three 26.2's I have ran. 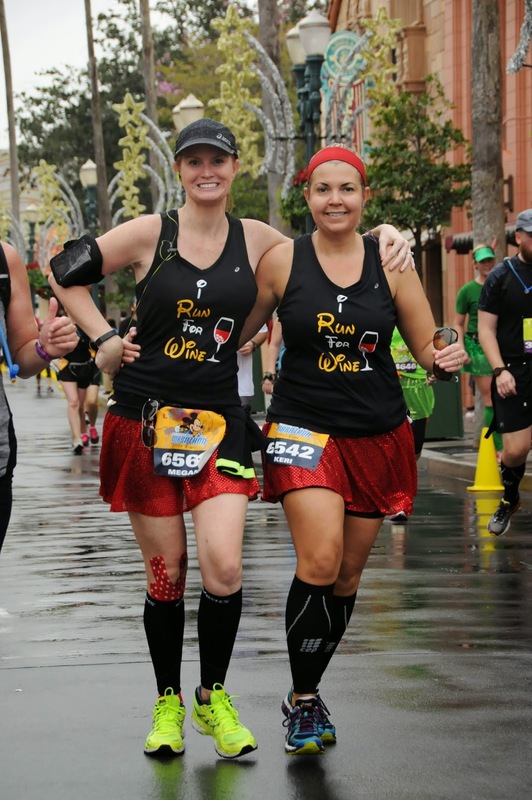 This was the first time running a full marathon with someone - that someone being my best friend of 28 years, Keri. 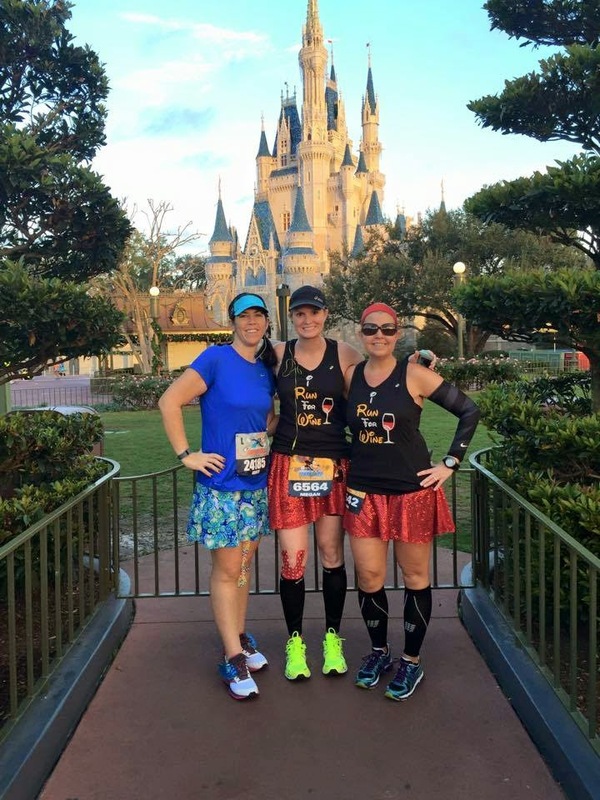 Keri is the first one of our group to start running and completed her first half marathon at Disney in 2012. That was also the weekend of my first 5K. It's incredible to see how far we have both come in the past few years and I was honored to cross the finish line with her. 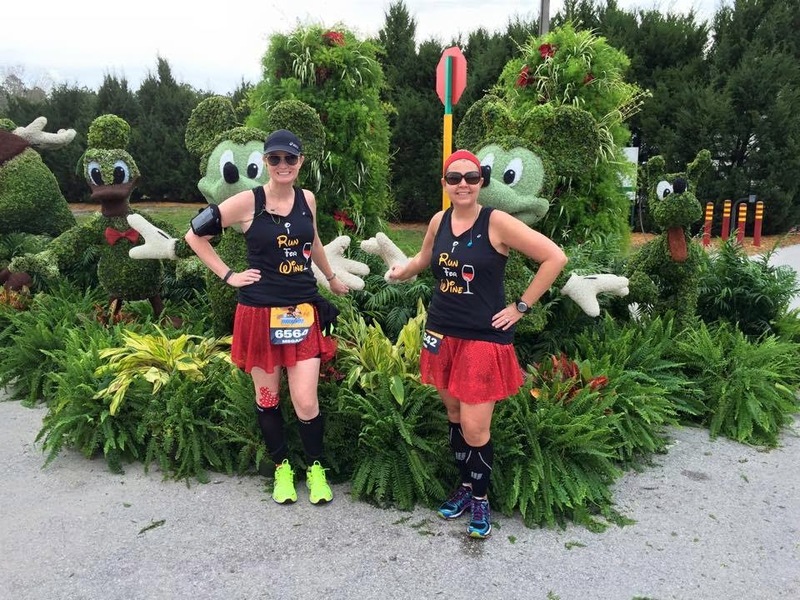 We started in Coral L with my friend Ashley (The Pavement Princess) and I quickly realized that running 26.2 with friends is far more entertaining that running alone. There are some downfalls - when someone has to use the bathroom when you don't, or when you want to walk an extra minute on intervals while the other doesn't. Those things aside, it was great running with these ladies! We decided not to stand in line for any photos until we got to Cinderella's castle. 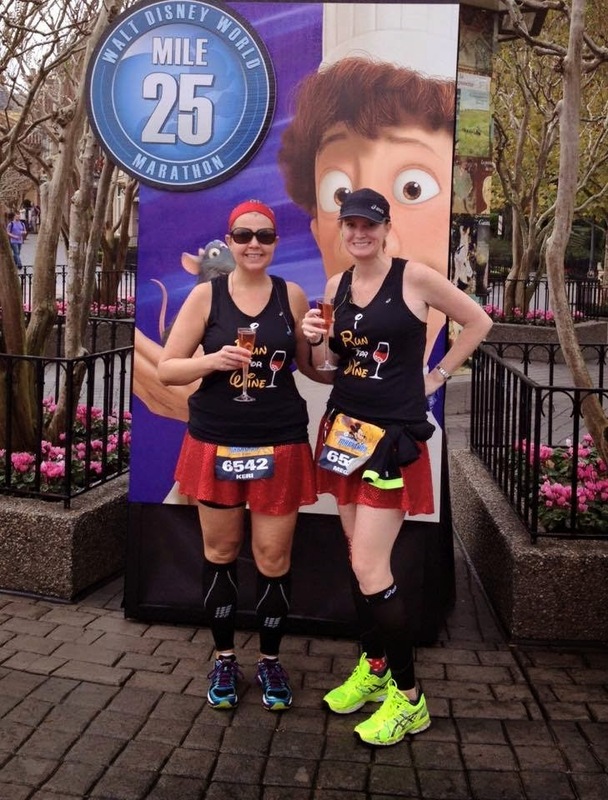 With all of the runDisney races Keri and I have done over the years, we have the majority of the character stops. Not to mention, the lines for 2015 were WAY longer than 2014. I stopped at nearly every photo opp last year and maybe had to wait in line behind 3 people. This year, it was 20+ people deep for nearly every photo. I yelled at another runner. The picture above was taken by a marathonfoto photographer. The guy in front of us was standing to get his pic taken, and we were held up. So we decided to pose for 1 second to get our pic taken. This is not a big deal as everyone in later coral's has to walk down the castle ramp due to major crowds. The women behind us started "Seriously" "Are you kidding me". To which point, I turned and said "oh right, because everyone else isn't walking and stopping. Sorry to hold you up". I felt bad about that over the next 20 or so miles. No reason for me to act out because others are rude runners. We split from Ashley around mile 6 and I was worried about Keri and I arguing. The thing about being friends with someone your entire life is you act like sisters. We actually behaved ourselves! I did have two negatives in my mind - Disney Speedway and ESPN Wide World of Sports. The bad thing about knowing the course is awareness of bad spots. However, the Speedway wasn't as torturous as 2014 and before I knew it, we were out of there. After going through the Disney water plant (stinkyyyyyyyyyyy), we headed off to Animal Kingdom. I forgot how short that part of the course was. I was jealous of all the runners doing Expedition Everest. My equilibrium would never allow me to go on a roller coaster at mile 13, with 13 miles to go. So instead of riding a roller coaster, I happily ate my pretzels at mile 13. I was VERY tired and unsure of how I could do another 13 miles. The feeling I had at that point was similar to hitting a wall and I couldn't figure out why. Around mile 16 is when I realized I forgot to take my second Gu. No wonder I was so tired! Also, the mental impact of the dreaded ESPN Wide World of Sports was upon us. It is daunting to see runners on opposite sides of you, them at mile 21, you at mile 15 for multiple miles. While you are cheering them on, you secretly hate them while wanting to be them. Once you get inside of ESPN, you have a 5K inside the sports complex and many miles after exiting before you enter Hollywood Studios. Also, around this time it started raining on us. The rain was off and on for a long time. Plus it started getting pretty humid. Sometimes it was drizzling while other times it was coming down so hard I had water pouring off of my hat. We decided to stop for a few photos inside of Hollywood Studios. The one pic I insisted on taking was in front of the Disney Hollywood Studios hat. They started taking it down this week. There are many people who hate that hat, but to me it is a key memory of Hollywood Studios. You'd never know in the photo above that we had just ran 23 miles. There are reasons for this....leaving Hollywood Studios had us both in great spirits. My Mom called and said she was waiting for us in Epcot, at France by the mile 25 sign....with two glasses of Moet Rose Champagne!!!!! Let me tell you - we picked up our pace in a quick manner. She also had bags for us to put around the tops, so we could run with the glasses! We took a few sips, wrapped up our glasses and went on our way. We only had a mile left and we wanted to cross the finish line with champs in hand. 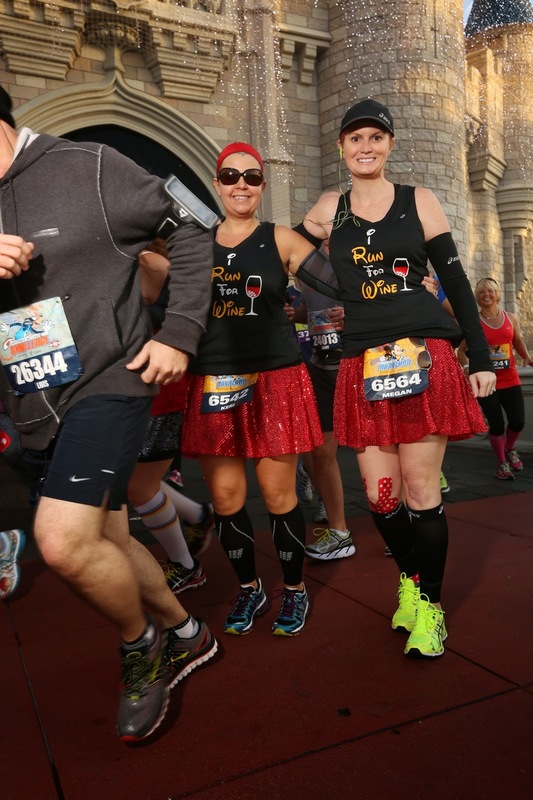 I've heard many stories of those who run Disney events, drinking the last mile in Epcot. This will be a new ritual. 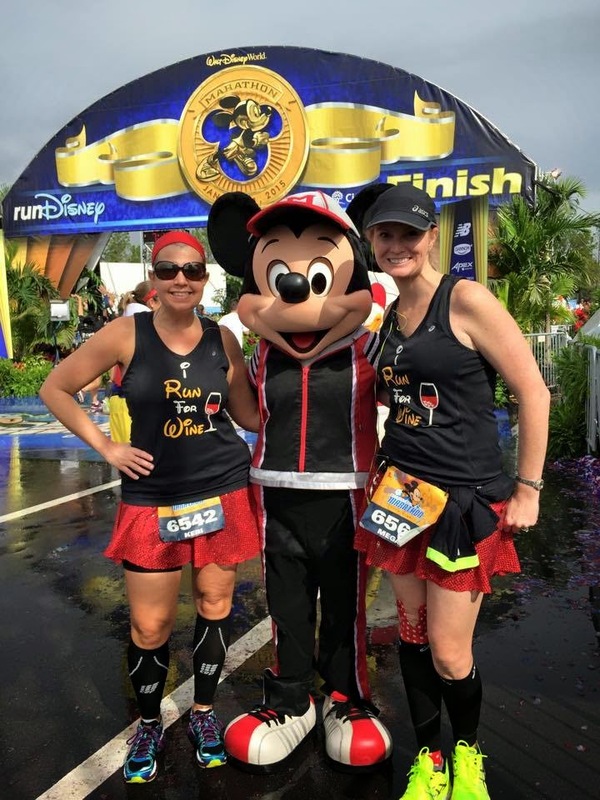 When we got to the finish line, I saw Mickey, Pluto and Donald - in their normal sports. However, this time was different....we could take photos with them!!! In the past, you were strictly forbidden to stop and get a photo at the finish line. I will always cherish this pic!! At the end, my Mom, Gabe, Keri's Dad, Gabe's parents and Keri's husband Jeff met us. It was the best I have felt post marathon. My ankle didn't bother me once. My knee was another story but I will take knee pain over ankle pain any day. Keri and I even came back to Epcot later that day to drink around the world (more on that later). Overall it was a great experience. 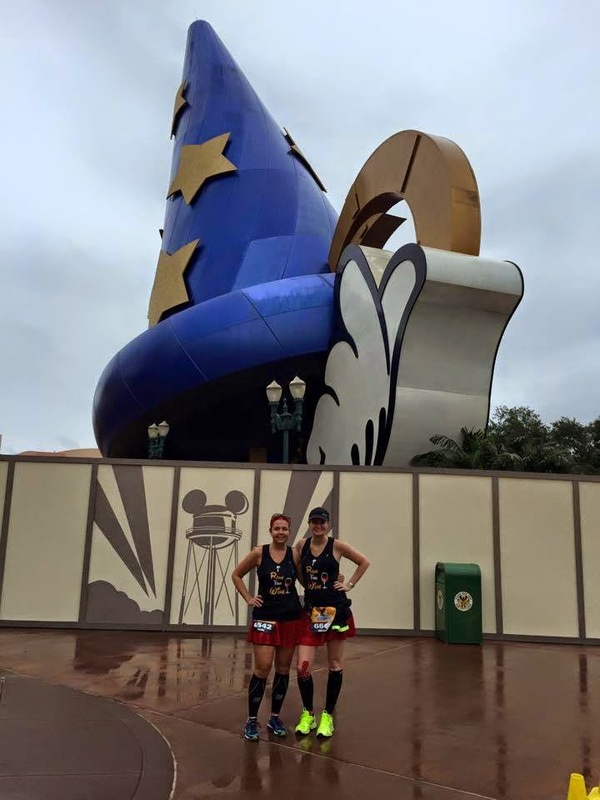 It was not the time either of us wanted, but one thing I know about runDisney events, always expect to be slower than you really are. 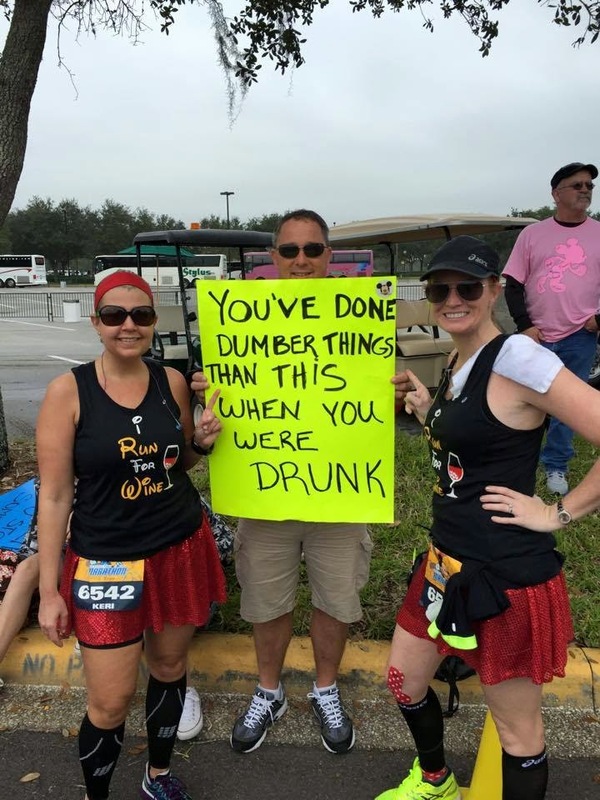 Between weaving in and out of people, running off course to use real restrooms and stopping for multiple photos, your overall time will be slower than normal. 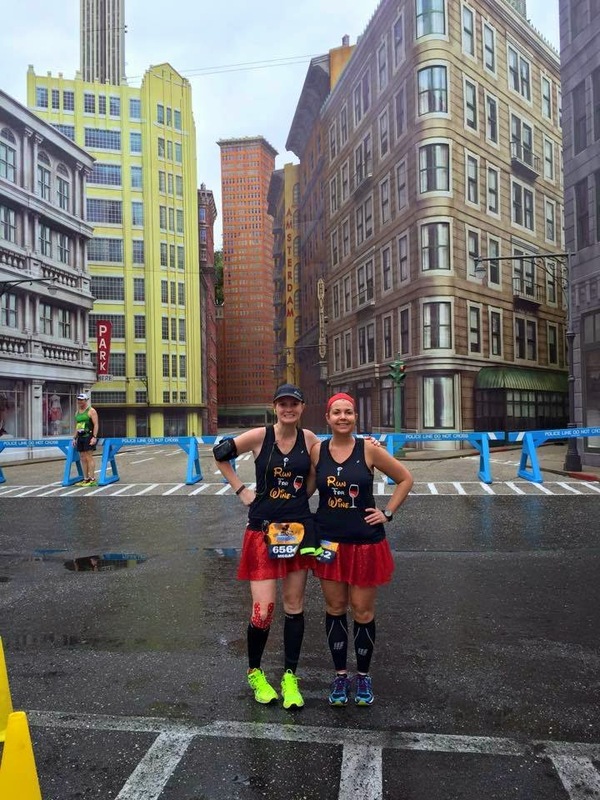 I easily ran the 2014 NYC Marathon in under 6 hours with hardly any training. 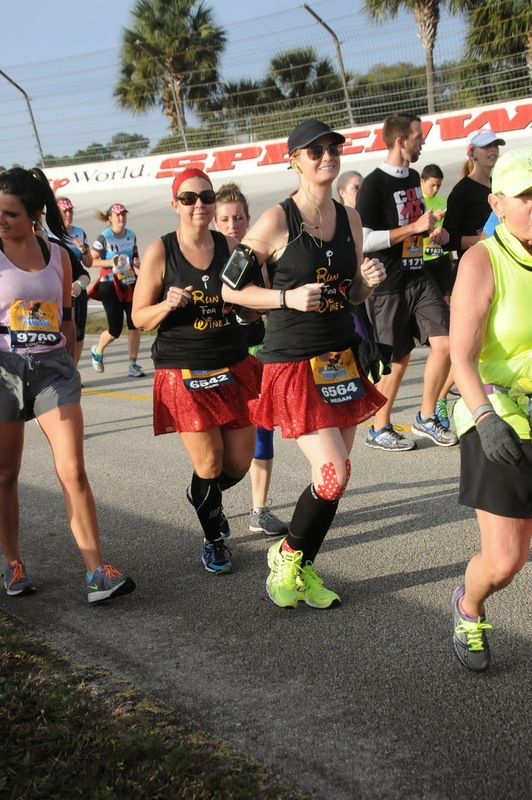 Meanwhile, I was trained for this one and we finished at 6:40, 8 minutes off of my 2014 Dopey Challenge time (where I stopped for nearly EVERY photo). 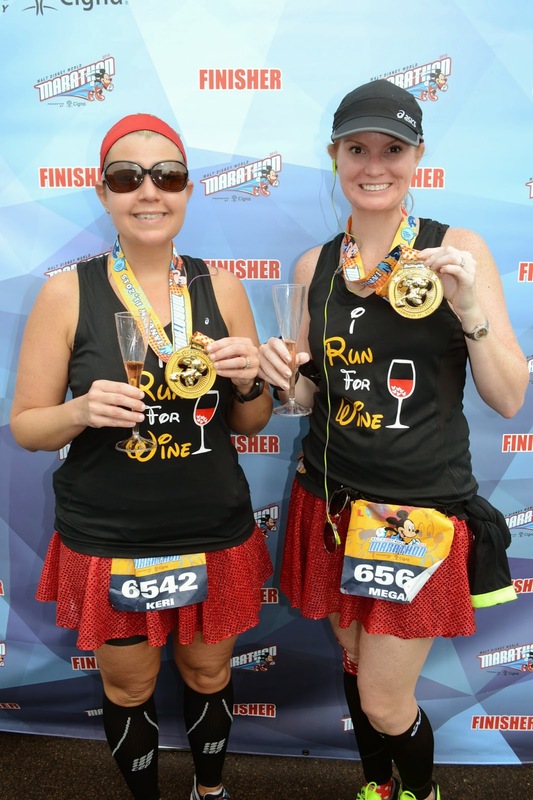 I don't understand the timing but I am still proud and was honored to cross that finish line, with my best friend, champagne in hand. 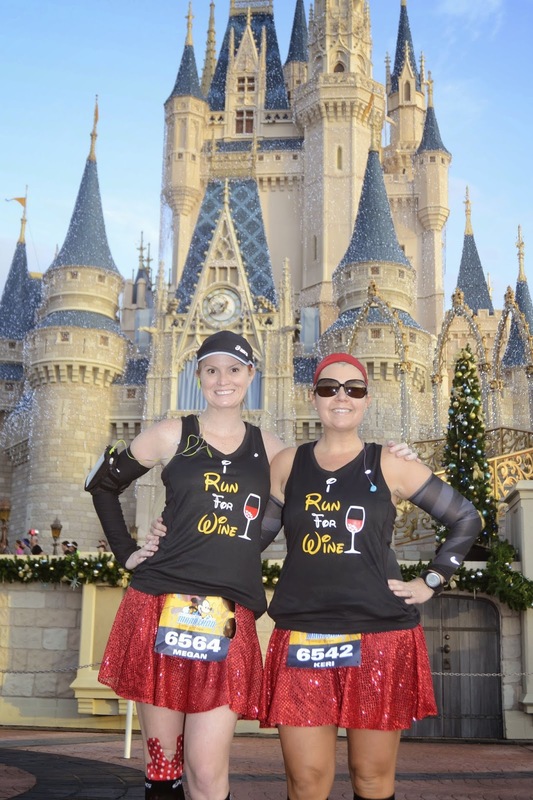 If your shirt says "I Run For Wine", get ready for EVERYONE to respond, I do too! Even if you are slower than expected, know that only 4% of the population can call themselves marathoners. Congrats Megan! I'm so happy for you and Keri! I enjoyed running with you ladies for the first six miles. Wish I didn't get injured so we all could've carried on together. Love your champagne finish!